This paper was originally written in 2010 for a Corporate Innovation class at Kellogg; please forgive any formatting errors carried over in the conversion from PDF, as well as the excessive footnotes! 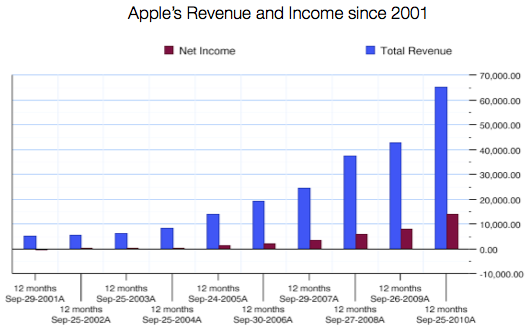 Apple’s unbroken string of success seems to suggest it is impervious to the Innovator’s Dilemma. Why has it been so successful, and can it be replicated? This uninterrupted success is quite remarkable in technology, which considers upheaval a matter of course. For example, in the PC industry, IBM pioneered the segment, and was surpassed by Compaqʼs low-cost model. Then, Compaq was surpassed by Dell and its direct sales model. Now Dell has been passed by HP with its superior retail channels. HP itself is strongly threatened by Acer and other Asian manufacturers. Another example is the Internet: AOL gave way to Yahoo!, which in turn has given way to Google. Moreover, this sort of disruption is, according to Bower and Christensen, endemic to well-run companies. 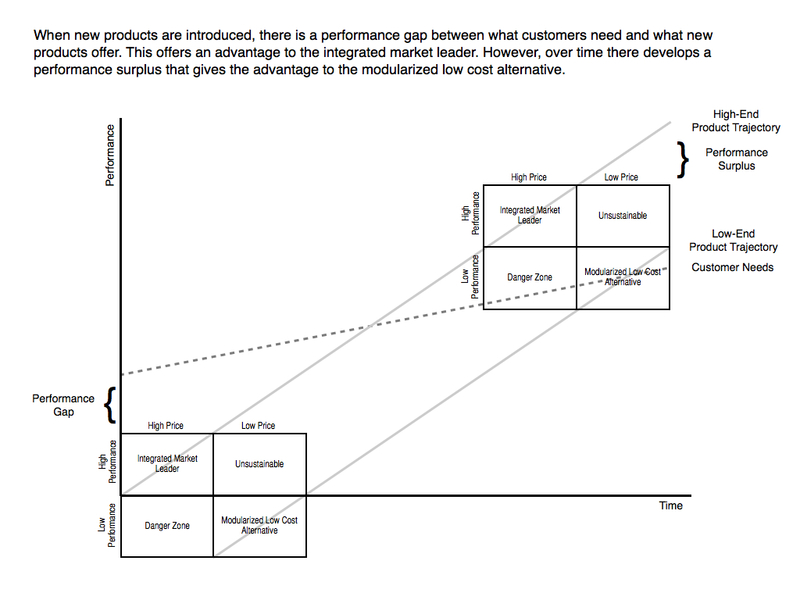 However, over the long-run, integrated companies produce a product that is “too good,” and “customers are happy to accept improved products, but theyʼre unwilling to pay a premium price to get them.”7 Instead customers make decisions on different vectors than performance, such as cost or convenience. This, in turn, favors modularized solutions that allow for increased flexibility and lower cost. “Many consumers are more than happy with something thatʼs good enough, and cheap.” Or, to put it in technical terms, many consumers are more than happy with low-end disruptors. So how did the iPod accomplish the impossible and avoid low-end disruption? While it is true that powerful branding that established the iPod as a must-have status symbol played a role, there were also important strategic moves Apple made to counteract low-end disruption. Moreover, Apple is following the same strategy with the iPhone and iPad, and while it is still too early in the smartphone and tablet industries to draw any firm conclusions about their long-term success, the iPodʼs history certainly portends well. This article will examine those strategies (using examples from the iPod, iPhone and iPad) through the framework provided by Christensenʼs model. 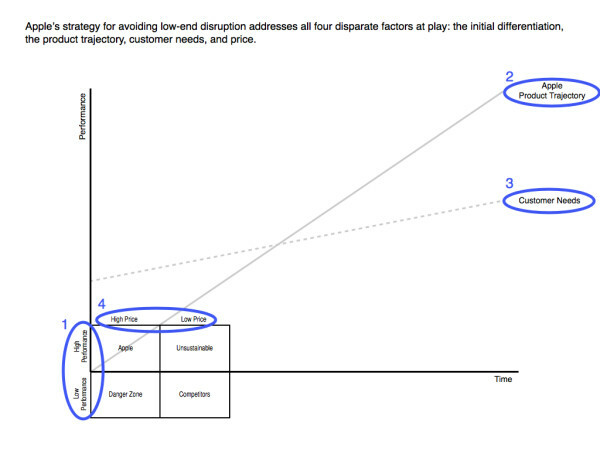 In that model of low end disruption, there are several disparate factors at play (Figure 2). The majority of innovators tend to focus exclusively on their differentiation, and milk that advantage for as long as possible. Apple, on the other hand, manipulates all four factors, putting off the threat posed by the Innovator’s Dilemma. And then they pull off the ultimate escape act: disrupting themselves. Apple’s primary means of differentiation has remained remarkably consistent ever since the first Macintosh — their products have a superior user experience. While the factors that go into this advantage are many, it has proven remarkably difficult to copy. Consider the Macintosh: Microsoft-powered computers enjoyed an advantage in performance and features from the very beginning, yet the Macintosh remained an extremely profitable product for over ten years for no other reason than its ease-of-use. It was only until Windows 95 that the Windows user- experience became “good enough” to lead Macintosh customers to abandon the platform for Windows computers that were superior in every other way. Apple’s has maintained its user experience differentiation via innovative user interfaces with its other breakthrough products. For example, the iPod introduced the click wheel and the iPhone multitouch. However, Apple has actually expanded its user experience advantage, primarily through iTunes. Prior to the iPod, the only way to add music to an MP3 player device was to ʻmountʼ the device to your computer, and copy files over manually. All organization had to be done by hand through folders and naming conventions, and file operations could be done on the device itself.18 In the case of the iPod, however, iTunes on your computer completely managed the music. All a user needed to do was plug in their iPod. In this respect the iPod and its user experience are best viewed as an entire system, not just standalone devices (a situation that is also the case with the iPhone and iPad). The iPad has incorporated all of these advantages in the user experience to pioneer a new category that in many respects depends on a superior user experience to be worthwhile. A tablet is severely limited in comparison to a computer when it comes to features, and to a phone when it comes to mobility. The only reason for a tablet device to exist is if it delivers a superior user experience, and while few competitors to the iPad have yet to appear, it seems likely that Apple’s initial differentiation will be the largest yet. 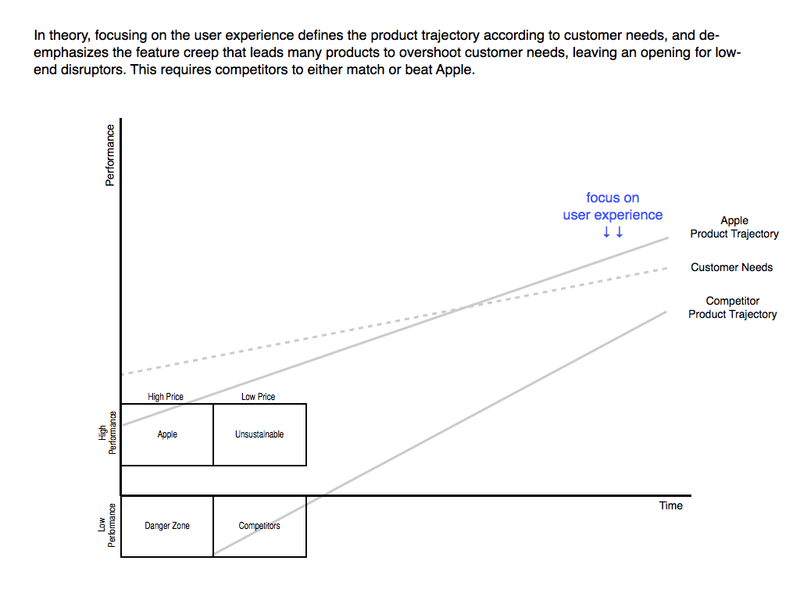 Apple’s focus on user experience as a differentiator has significant strategic implications as well, particularly in the context of the Innovator’s Dilemma: namely, it is impossible for a user experience to be too good. Competitors can only hope to match or surpass the original product when it comes to the user experience; the original product will never overshoot (has anyone turned to an “inferior” product because the better one was too enjoyable?). There is no better example than the original Macintosh, which maintained relevance only because of a superior user experience. It was only when Windows 95 was “good enough” that the Macintosh’s plummet began in earnest. This in some respects completely exempts Apple from the product trajectory trap, at least when it comes to their prime differentiation. However, even when you consider other more traditional features, Apple has demonstrated a remarkable level of restraint. 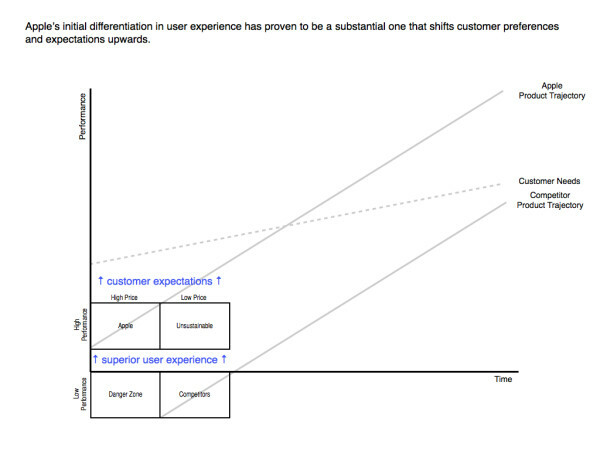 This especially has been the case in version 1.0 products. For example, the original iPod lacked the more common USB connection standard, and more critically, did not work on Windows. The original iPhone lacked features such as copy-and-paste, 3G connectivity, and multitasking. The iPad does not have a camera and also lacked multitasking. The net result of these omissions is that Appleʼs version 1.0 product often falls significantly below the consumer preference line for traditional features, meaning that adding features is more likely to bring the product up to the consumer preference line (as opposed to extending above it). Moreover, those features are added relatively sparingly, reducing the slope of the product trajectory line. 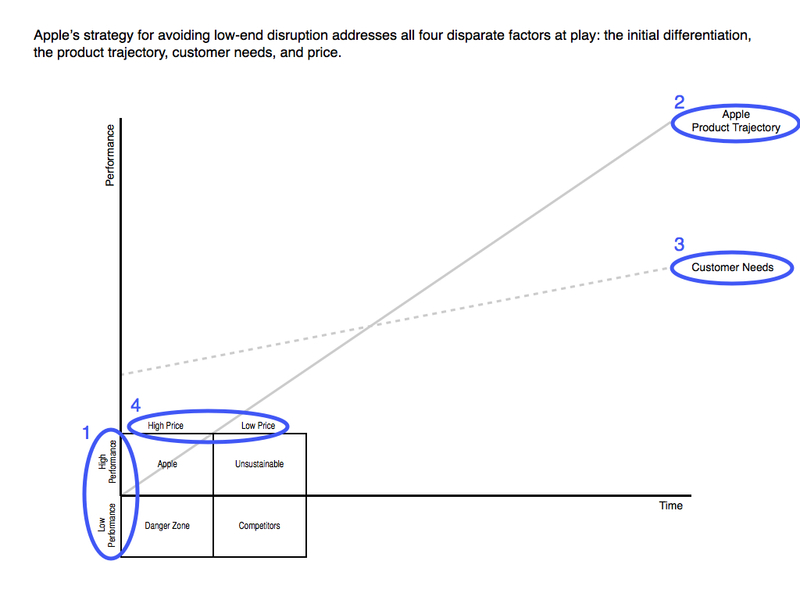 This creates a fascinating dynamic vis a vis the competition. The reason Apple can successfully launch products that lack seemingly critical features is because of the intense focus on the user experience; however, competitors usually view the lack of features as an opportunity and quickly launch products that seem similar but with better features. However, they rarely if ever match the Apple user experience and usually fail to compete successfully. Therefore competitors quickly iterate and launch new products with more features. This results in the competitorsʼ products quickly overwhelming customers with features — the path supposedly reserved for the innovator! In this respect, it is the followers who fall prey to the Innovator’s Dilemma. 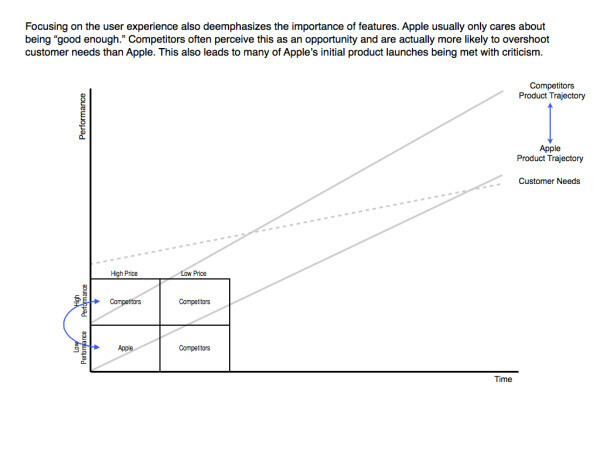 As a category creator, Apple’s first advantage is the ability to shape consumer expectations. For example, the iPod created the expectation that music transfer to a portable player be completely seamless, and introduced the patented click wheel. The iPhone defined the form factor and interaction paradigm for future Internet-focused smartphones, and created the concept of an app store. These efforts defined the direction of customer needs in a way that favored Apple. Third, Apple’s retail stores further increase the customer needs trajectory. All of Apple’s products are available for unfettered use in the retail stores, and retail associates willingly spend time demonstrating the capabilities of all of Apple’s products. Continuing with the Facetime example, Apple created a special toll-free number that store visitors could call to try out Facetime from the retail stores, demonstrating the feature and creating demand. The stores also offer trainings and workshops that not only improve the user experience of buying an Apple product, but also ensure that customer’s are exposed to and demand all of the features in a given Apple product. The net effect is that even from a feature perspective Apple products are much less likely to outstrip customer needs; moreover, competitors have no choice but to match every feature, but without the customer service and ease-of-use of Apple, which creates unwieldy products. 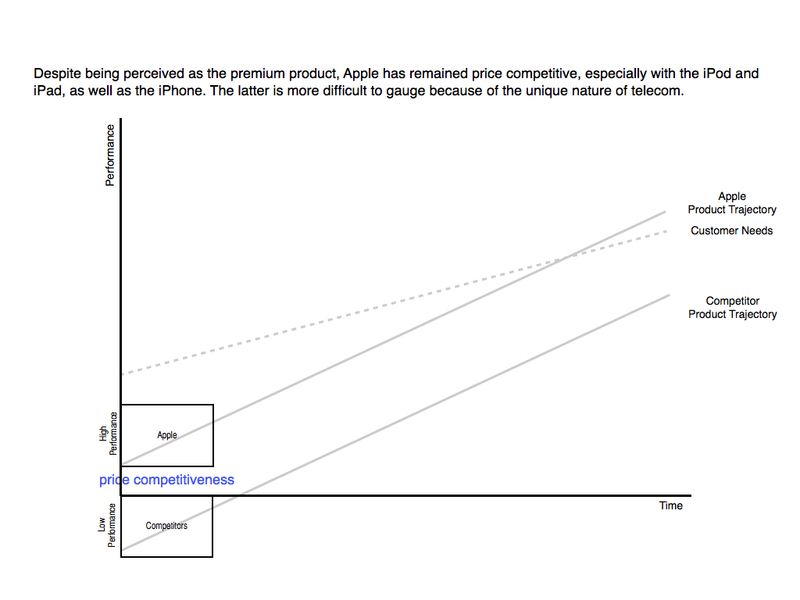 The iPhone is similarly competitive, primarily due to the unique nature of the wireless industry where most phones are subsidized and customers have to agree to two-year contracts.30 Moreover, phones often decline in price over their lifespan in response to consumer demand (or lack thereof). 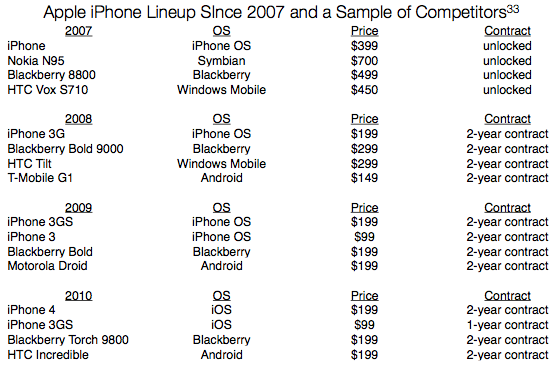 On the four major wireless networks…there are 13 smartphones priced at $199 with a two-year contract. There are no phone models with a higher starting price (add-ons like more memory can increase the price tag), and there are more smartphones selling at $199 than at any other single price point. One reason Apple has been able to remain so price competitive is by securing its flash memory supply, a key component in the iPod Nano, Shuffle, Touch, iPhone and iPad. In 2005, Apple reached five-year agreements with multiple memory vendors to secure its supply at favorable prices through 2010 and foreclose competitors.33 In addition, Apple has benefitted from tremendous economies of scale befitting its dominant position in the market. While the tablet market is still nascent, it appears that Apple has priced the iPad very competitively as well. The entry level iPad, with a 9” screen and Wi-Fi networking retails for $499, $629 with cellular networking. The only comparable product on the market, the Samsung Galaxy Tab, has only a 7” screen, and retails for $600 with cellular networking. 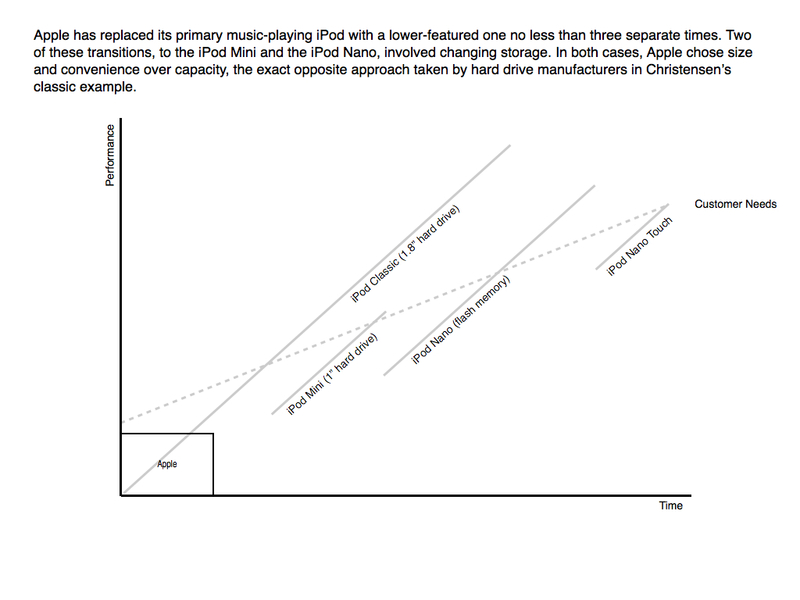 By enhancing the iPodʼs initial differentiation, focusing product improvements on the user experience and high-value features, educating customers and staying competitive on price, Apple in many ways forestalled or downright reversed the Innovatorʼs Dilemma in the MP3 Player market. However, itʼs important to note that they also had the discipline to disrupt themselves. And then they killed that too. 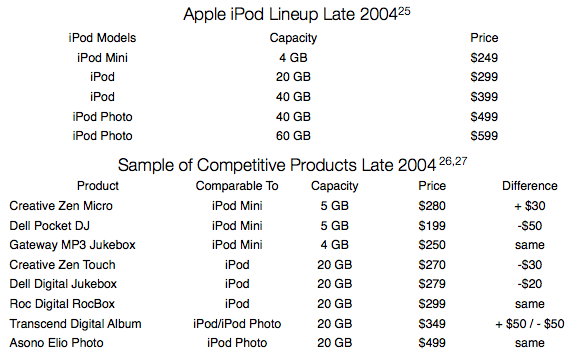 On September 7, 2005, just 20 months after the iPod Miniʼs introduction, Apple discontinued it and launched the iPod Nano, an even smaller device that used flash memory — and had less storage (2GB and 4GB, versus 4GB and 6GB for the Mini).36 Apple disrupted itself again using changes in the exact same sort of media (storage) that felled market leader after market leader 30 years ago. And now, The iPod market is decreasing every quarter, largely due to “the best iPod ever” introduced in January 2007. It is more commonly known as the iPhone. 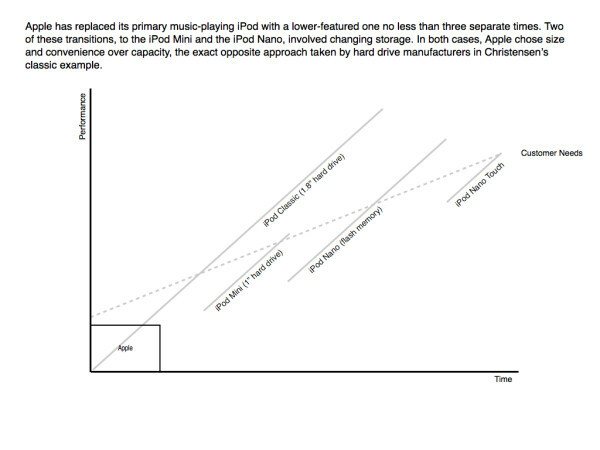 Beyond creating disruption within the MP3 player market, Apple in the end disrupted the market as a whole. When Christensen and Bower talk about meeting customer needs, they are concerned with performance and specifications. 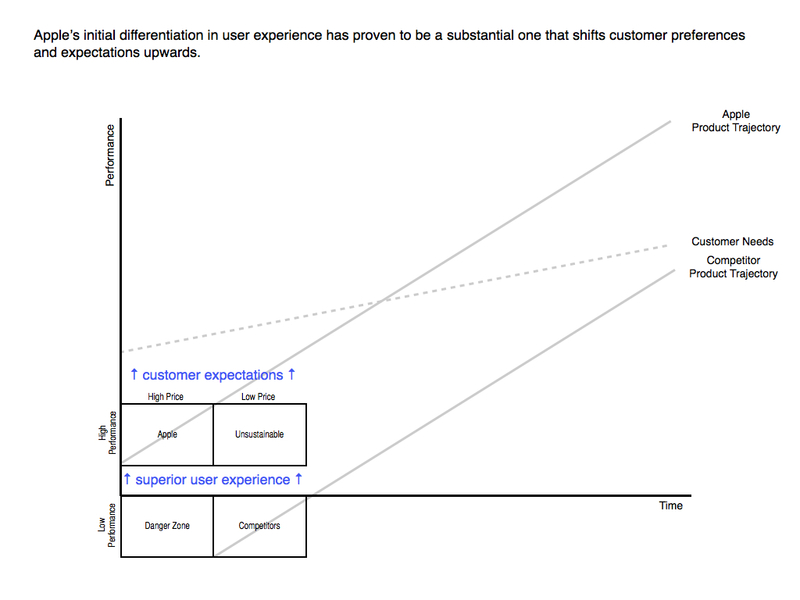 This article has already laid out many of the strategic benefits of this intense focus on the user experience: it creates significant differentiation, sets customer expectations, and makes it impossible to overshoot customer needs — products are never “good enough” with regard to the user experience. 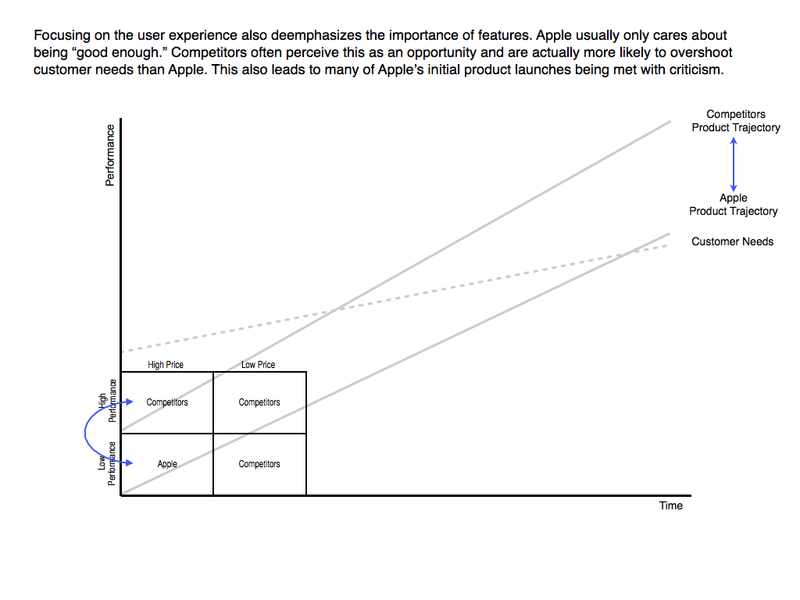 If there is ever a choice between enhancing the user experience of a product or improving its profitability, Apple, unlike nearly any other company, chooses the former, cementing the strategic advantages conferred by a focus on the user experience. Consider the iPhone: there is no vice-president for iPhone. Rather, there is a vice-president of iOS, the software; a vice-president of hardware engineering; a vice-president of industrial design; a vice-president of operations; and a vice- president of product marketing. Each is of equal stature and expected to contribute according to their function — to deliver against a profit-and-loss number is organizationally impossible. 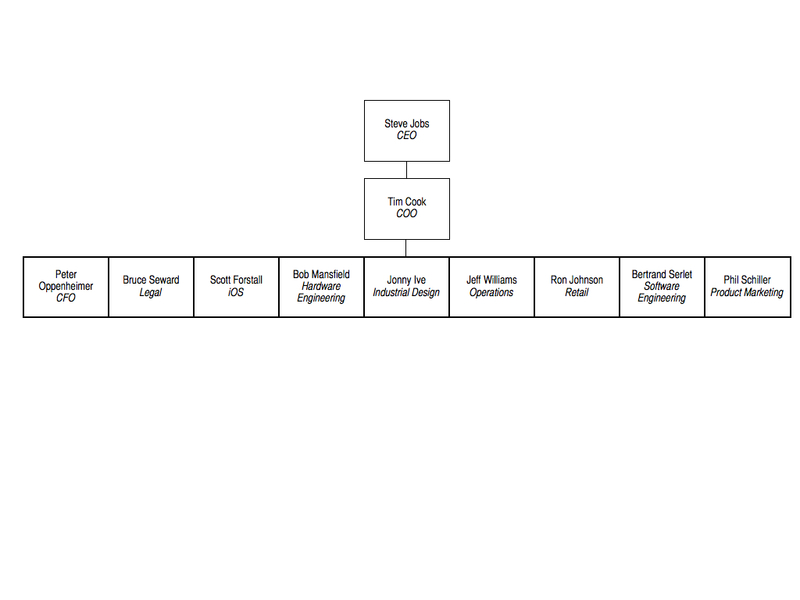 This also fits Appleʼs structure. 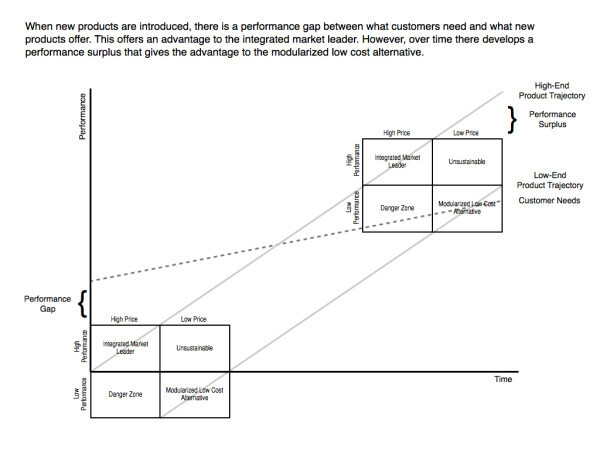 By focusing on delivering new-to-the-world solutions in emerging markets, Apple ensures it is competing in the “not- good-enough” segment of the market where integrated providers are at an advantage, instead of the “more-than-good-enough” follower market where modularized competitors have an advantage. 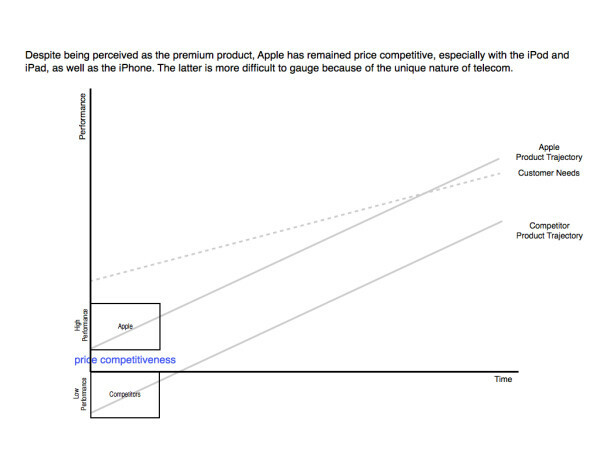 Given Appleʼs market cap, it is amazing to consider that it has only four main product lines and 14 main products. This also leaves Apple free to pursue new opportunities, as in the case of the iPod. 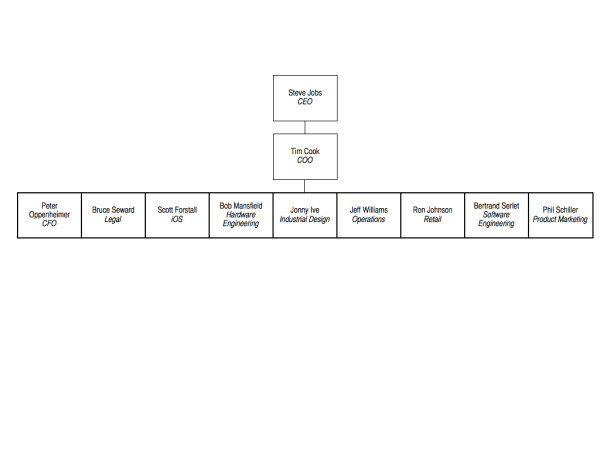 Moreover, it makes Appleʼs unique organizational structure possible. Dupont pioneered todayʼs modern organization structure with multiple profit- and-loss centers after World War I because functional organizations simply donʼt scale to multiple product lines, and they wanted to sell paint in addition to gun powder.47 When you consider the fact that Appleʼs organizational structure is integral to its strategy of obsessively focusing on the user experience, then limiting the product line to preserve that structure is much more understandable. Many will read this quote and despair at ever having a Steve Jobs run their company. But I believe that for all of Jobs brilliance, the secret of Appleʼs success is about design and a different way of thinking. Design at its essence, is not just about form, and not just about function. Instead, itʼs both, and more. 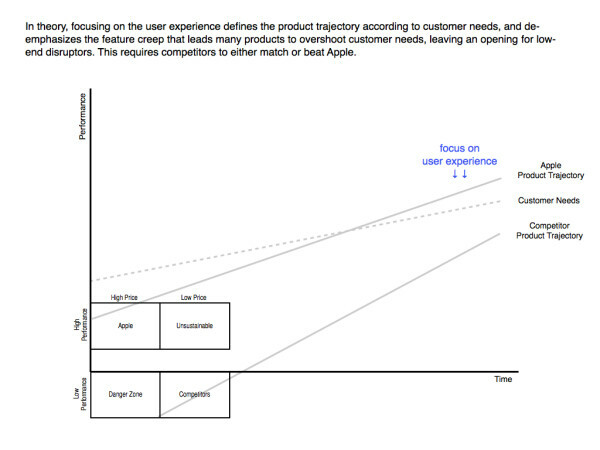 It is ultimately about the user and delivering exactly what they need, not just what they say they want. Apple takes it as their responsibility — what customers pay them for — to both know technology and customers better than customers know themselves and deliver products that truly surprise and delight. And it is suprise and delight that builds a powerful and long-lasting brand that goes from success to success without any dilemma at all. Of course, itʼs worth remembering that Henry Ford was disrupted, and rather abruptly at that. Appleʼs course, like all high reward ones, is also high risk. Stringently focusing on just a few products and saying no to a hundred more requires extreme discipline on the part of the CEO, as well as significant respect within the ranks for the CEOʼs decisions. Jobs has both, but whether or not his successor will is another question. A second risk raised by Appleʼs extreme focus is the possibility of getting it wrong with one of their core products. Without a diversified portfolio, a significant misstep could be extremely costly. Another challenge is maintaining the intrinsic motivation that compels employees to create amazing products despite no direct compensation for doing that (outside of stock options). 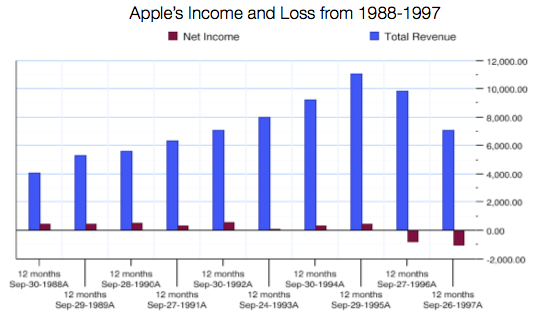 However, the biggest risk in my mind is forgetting the lessons of the 90s when Apple was disrupted. In many respects it seems that nearly going bankrupt drove many of the strategic decisions recounted here, and other companies ought to better understand and emulate Apple now before Apple itself forgets how it got here.